Restaurants open and close. That is a fact of life. It's a tough business and with the current economic climate, it comes as no surprise that some just don't cut it. So when I drove by the former location of Fortune Court on Hastings one day and noticed a big trash bin in front - that was an indication of something new was in the works. Days passed. Even months passed. Those renovations were taking forever! It was akin to following a Corolla down a residential street (with lots of intersections, stop signs or not). Then, out of the blue, I got an email from the restaurant itself. I say this with some surprise because it is not ve ry often I get emails from Chinese restaurants. It is nice to see that they are finally seeing the benefit of promoting themselves other than the Chinese newspaper. The email was mostly informational and stating that I should try them out since they were open. Sounded good to me. So I grabbed the family and headed out to see what their Dim Sum service was like. Of course, a dinner visit would follow eventually. Looking over the interior, it became clear why they took so long to renovate. The place received a complete overhaul (however, they might want to look into less slippery washroom floor tiles...). 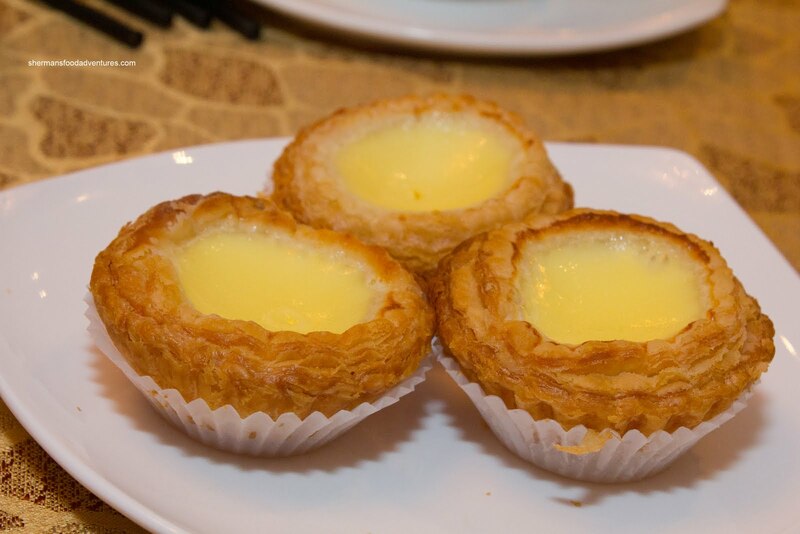 After ordering on the flashy dim sum order sheet, complete with pictures, we got the Egg Tarts to start. This was the 3rd Dim Sum meal lately we've had dessert first. Oh well... Despite the thick puff pastry, the tart was light and flaky. The filling was almost airy and only semi-sweet. On the menu, it described it as a milk custard, and it definitely showed in the texture. Next, we had the Shrimp Mousse-Stuffed Eggplant. One look at the sauce and we were not really sure what it was. Usually, there would be some sort of black bean sauce on top. This sauce had a one-note flavour (which was salt) and really not enough punch. 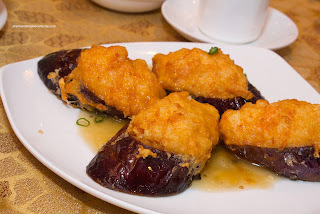 On the other hand, the eggplant was thick-cut and fried perfectly. It still retained some texture while being completely soft. The large clump of shrimp mousse had a nice bounce texture and was seasoned well. Again, this dish would've benefited from some peppers and true black bean flavour. For the kiddies, we got the Chicken Rice served in a hot pot. This was a pretty large pot of perfectly cooked rice. It was slightly dry, chewy and had a nutty taste. This was exactly the desired texture and flavour, unlike some other places which merely stuff pre-cooked rice into a hot pot and call it a day. As you can clearly see in the picture, there was a good mix of moist flavourful chicken, Chinese preserved sausage and a token piece of broccoli. I have to admit this was one of the better versions of this dish we've had in awhile. 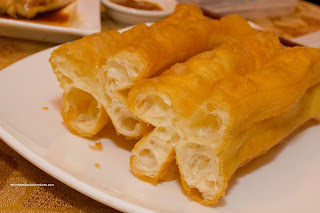 And when we order stuff for the kids, we cannot forget my son's favourite - the Pan-fried Soy Rice Noodle Rolls. Again, this was a large portion due to its relatively neat plating. 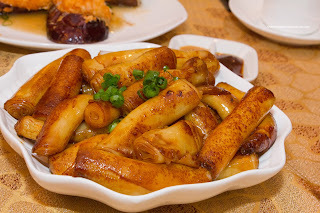 Most times, the rolls are haphazardly chucked onto the plate resulting in broken pieces and ultimately smaller portion. Sure, places such as Come Along would place the rolls parallel to each other, but this was neat enough already. Furthermore, the noodle was soft while still retaining some bite. Yet the best thing of all was the good sear and caramelization of the sweet soy on the exterior. Now, as for the Steamed Shrimp Rice Noodle Roll, it was equally as good except the noodle roll could've stood for a touch less thickness. Otherwise, it was stuffed to the max with a shrimp-shrimp mousse mix. I felt that the mousse was a bit too prevalent which took away from the whole pieces of crunchy shrimp. Overall, it was a good value since it was big and full of filling. 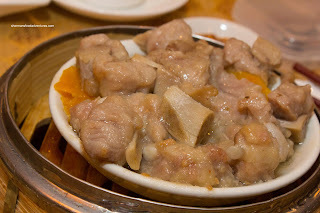 One of my personal favourites of Dim Sum is the Steamed Pork Spareribs. You'll notice that I did not add "black bean" into the name. The reason for this is because there wasn't any. Hence, we felt the spareribs were mostly one-note in flavour (which was salt/MSG). Despite this, the meat itself was tenderized perfectly. It was a good balance between being moist and still have some chewiness. Loved the pumpkin underneath. Too bad it was mushed into little pieces. In addition to the spareribs, we always go for some offal. This time, we chose the Steamed Bible Tripe. We liked how it was presented in a glass bowl since it meant 2 things: more tripe and no spillage. Normally, when it is served in a small sauce dish, the liquid spills all over the place and the tripe subsequently falls out into the steamer. 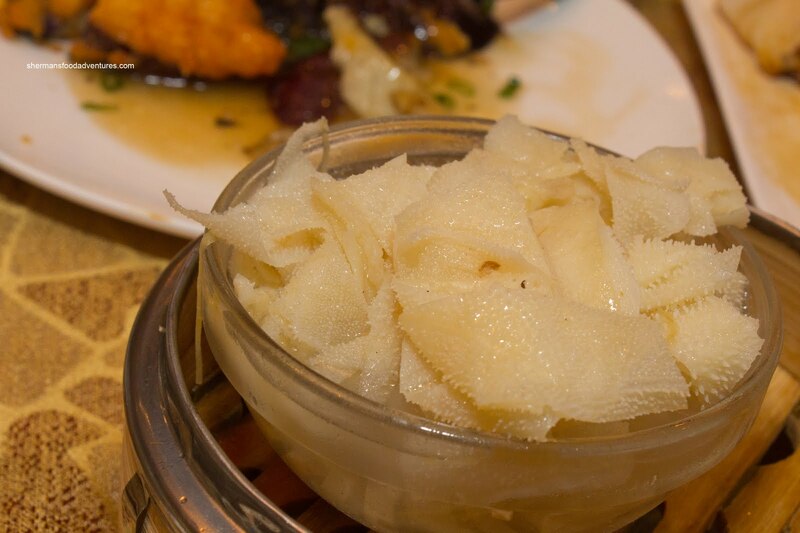 The tripe was well-seasoned with plenty of ginger, however, it was too chewy. It could've stood for more tenderizing. 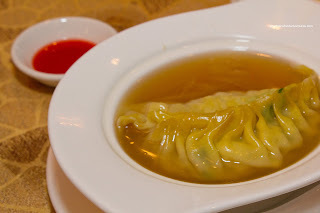 Mainly for Viv, we tried the Supreme Seafood Dumpling with Shark's Fin. For me, I've stopped eating shark's fin, so Viv ate it (she did remark it was too crunchy though). However, I did get to try the dumpling and it was good. 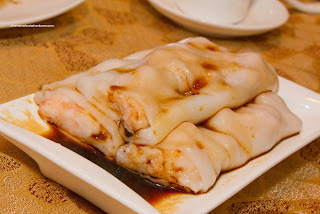 The skin was thin while there were chunks of crunchy shrimp and scallop mixed with pork. The flavour was mild and so it should be since this is usually a delicate dish. The consume was silky, yet on the saltier side though. Normally, one would order the Salty Donut without congee. Not us. We weren't in the congee mood except my son really wanted it since he spotted it at the next table. He kept pointing at it in excitement. Boy, is he easily pleased... A stick of fried dough... Anyways, it was a good thing we ordered it though. The fresh crispy, non-0ily exterior gave way to a fluffy and airy inside. Despite the lightness of the donut, it still had the signature chewiness of the dough. Really good. Nearing the end of the meal, we finally got the 2 items which usually make or break a Dim Sum service. Starting with the Haw Gow I would say they passed this test. 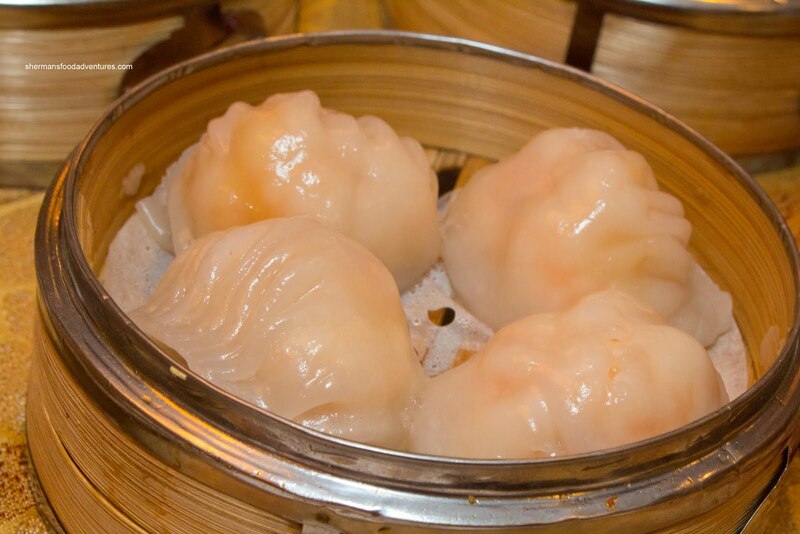 These massive shrimp dumplings were plump from the whole shrimp. 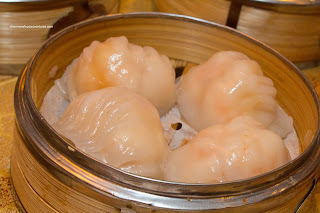 The dumpling skin was pretty good being cooked just right where it was slightly chewy, yet gave way to the shrimp with not too much effort. The shrimp inside had a nice snap texture and was not overly seasoned. 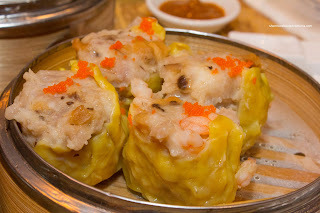 If the haw gow were any indication of size, then then one look at the Sui Mai, it was no surprise. These very large dumplings were chalk full of pork, shrimp and shiitake mushrooms. I really liked the fact they weren't shy with the shiitake since it helped break up the pork flavour. Of course, the pieces of snappy shrimp also didn't hurt either. With that being said, I felt that the dumpling could've been less dense. By no means was it bad, since the pork was properly tenderized and seasoned, it just could've been "looser". As much as I have broken down each dish and it might appear that there were many criticisms, that does not tell the whole story. In a nutshell, Golden Lake offers up more than decent Dim Sum at a very reasonable price. 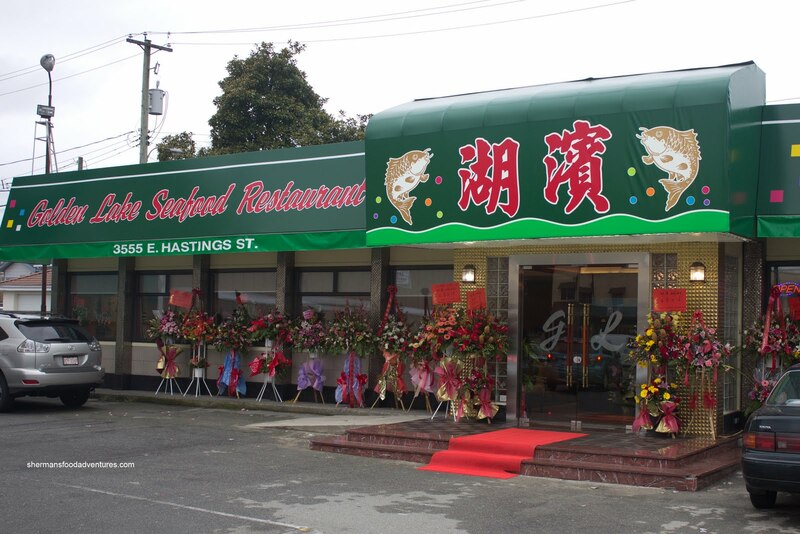 With the current renovations, the place went from ho-hum Chinese restaurant to mid-range. 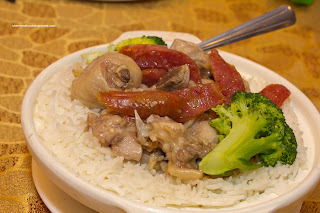 So with an enhanced dining room, more staff and above average food, Golden Lake fills a niche the area since there are not a whole lot of good Chinese dining options nearby.